✔【UPGRADED DESIGN】: Audew foot pump features dual cylinders and air flow up tp 35L/min. Almost double the speed of traditional foot pumps out there! Which ensures efficient & fast inflation. ✔【EASY TO USE】: Just step on the lever of the floor pump to start the flow of air (features large foot pedal with non-slip mat)! Easy to monitor air pressure with high accuracy gauge(2 reading units: PSI/BAR).Way better than annoying hand air pumps! 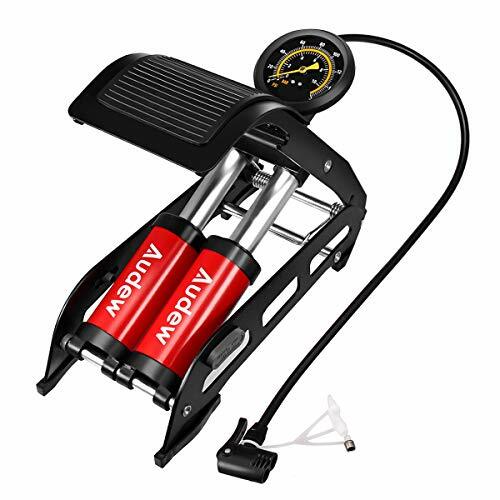 ✔【COMPACT & FOLDABLE】: AUDEW floor bike pump with compact and foldable frame design, the built-in safety pedal locking clips will keep the body steady and wouldn't pop out in suddenly. Perfect for travelling or home use, convenient to carry around! ✔【MULTIPURPOSE USE】: The smart valve head is suitable for presta, schrader and deutschland valves.Ideal for bike tire, air mattress, sport ball, and other inflatables(equipped with 3 nozzles adaptors), perfect for indoor & outdoor using! ✔ 【100% FREE WARRANTY】: AUDEW offers 12 months 100% FREE manufacturer warranty & 180 days replacement & 90 days refund (Non-artificial damage) & 24 hours friendly customer service. So order it with confidence! If you have any questions about this product by Audew, contact us by completing and submitting the form below. If you are looking for a specif part number, please include it with your message.